JUNO BEACH, Fla. — The Edison Electric Institute (EEI) presented Florida Power & Light Company (FPL) with the association’s “Emergency Assistance Award” for its contributions in restoring power to hard-hit North Carolina communities following Hurricane Florence. The blockbuster storm made landfall as a Category 1 storm on Sept. 14, 2018, and moved slowly throughout Southeastern and Mid-Atlantic states, causing extensive flooding and leaving many without power. FPL’s team of more than 900 men and women worked 16-hour days for nearly two weeks to get residents’ lights back on after Hurricane Florence. The team helped restore power to 25,000 homes and businesses in Columbus County, North Carolina and other areas hit hardest by the storm. In addition to getting North Carolinians back online, crews helped residents in need, such as repairing a flat tire for a driver and providing phone charging stations. The company deployed crews four times last year to assist partner utilities in restoring power to their customers. FPL crews, some working as long as three months, helped restore power in the Bayamon region of Puerto Rico in the aftermath of Hurricane Maria. 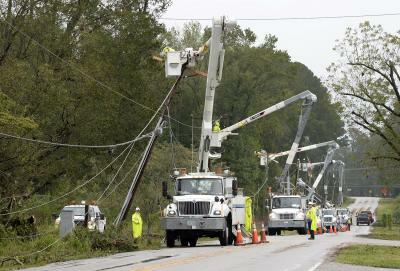 Crews also helped restore power in Florida’s Panhandle and Georgia impacted by Hurricane Michael. In addition to these events, FPL sent engineers to support the restoration effort for December’s Winter Storm Diego in the Carolinas and lineworkers to Paradise, Ca. following the devastating Camp Fire. This “Emergency Assistance Award” is given to select EEI member companies to recognize their outstanding response assisting other electric companies in power restoration efforts after service has been disrupted by severe weather conditions or other natural events. The winners are chosen by a panel of judges following an international nomination process. FPL received the award during EEI’s Winter Board and Chief Executives Meeting in Palm Beach, Fla.
EEI is the association that represents all U.S. investor-owned electric companies. Our members provide electricity for 220 million Americans, and operate in all 50 states and the District of Columbia. As a whole, the electric power industry supports more than 7 million jobs in communities across the United States. In addition to our U.S. members, EEI has more than 65 international electric companies as International Members, and hundreds of industry suppliers and related organizations as Associate Members. Florida Power & Light Company is the largest energy company in the United States as measured by retail electricity produced and sold, serving more than 5 million customer accounts or an estimated 10 million+ people across the state of Florida. FPL's typical 1,000-kWh residential customer bill is approximately 30 percent lower than the latest national average and among the lowest in the U.S. FPL's service reliability is better than 99.98 percent, and its highly fuel-efficient power plant fleet is one of the cleanest among all electric companies nationwide. The company was recognized in 2017 as one of the most trusted U.S. electric utilities by Market Strategies International for the fourth consecutive year. A leading Florida employer with approximately 8,700 employees, FPL is a subsidiary of Juno Beach, Florida-based NextEra Energy, Inc. (NYSE: NEE), a clean energy company widely recognized for its efforts in sustainability, ethics and diversity, and has been ranked No. 1 in the electric and gas utilities industry in Fortune's 2018 list of "World's Most Admired Companies." NextEra Energy is also the parent company of Gulf Power Company, which serves more than 450,000 customers in eight counties throughout Northwest Florida, and NextEra Energy Resources, LLC, which, together with its affiliated entities, is the world's largest generator of renewable energy from the wind and sun. For more information about NextEra Energy companies, visit these websites: www.NextEraEnergy.com, www.FPL.com, www.GulfPower.com, www.NextEraEnergyResources.com.